1. Mix chicken, cornstarch, salt, and white pepper in medium bowl. Cover and refrigerate 20 minutes. 2. Peel outer layer from broccoli. Cut broccoli stems crosswise into thin slices; remove flowerets. Cut stems diagonally into 1/4-inch slices. Place broccoli flowerets and stems in boiling water; heat to boiling. Cover and boil 1 minute; drain. 3. Heat wok or 12-inch skillet over high heat. Add oil; rotate wok to coat side. Add chili, brown bean sauce, garlic, and gingerroot; stir-fry 10 seconds. Add chicken; stir-fry about 2 minutes or until chicken is no longer pink in center. 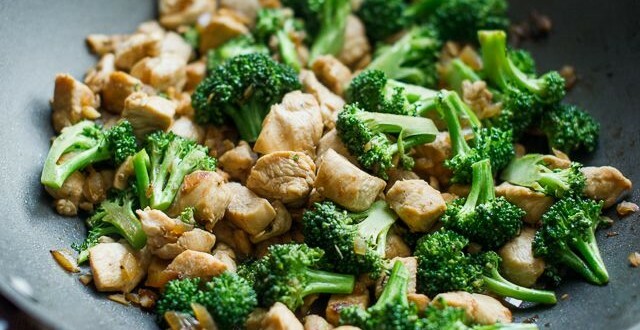 Add broccoli and green onions; stir-fry about 1 minute or until broccoli is heated through.